Join the discussion on our forums! Come discuss Forbidden Words over in our dedicated Forbidden Words discussion topic. Spend all your Mana. Destroy a minion with that much Attack or less. 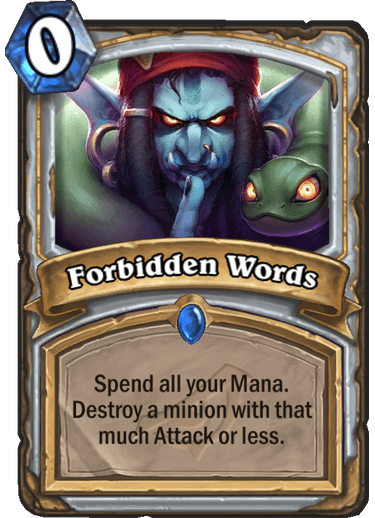 I would also like to mention that if you are at 0 mana and there is a 0 attack opponent (like that pesky chest with taunt), you can kill it with forbidden words. That's some good value right there. In my opinion, it’s overhyped card. In order to remove big threat, like 8/8, you need to spend all of your mana, skipping turn by that. It’s okey if you are ahead on board but not good if you are behind. It’s much worser than Shadow Word: Death, which creates great tempo swings. The real utility is to remove 4-attack minions. Yeah, that's probably like the entire purpose of this card and it makes it really good. The way I see it, it's worth spending your mana to destroy a bad minion, even if you're not doing it super efficiently. There's no reason not to include this alongside a Shadow Word: Death to ensure optimum removal. Honestly, you might even cut a Shadow Word: Death for this. I think this is really good. Every Priest deck should run this, and I know I will run it in mine.